Grace and peace to you from God our creator and our Lord and savior Jesus who is the Christ. Will y’all pray with me? May the word of my mouth and the meditations of all our hearts be acceptable in your sight O Lord, our rock and our redeemer; amen! So, last week we remembered and celebrated the baptism of our Lord Jesus. In conjunction with that celebration we also remembered our own baptisms. Between our services last week I was blessed and honored to talk with some of our youngest members about what baptism is. The physical parts of it. Water, oil, touch, holding, praying, speaking. As I talked, I invited the kids to put their hands in the font and play with the water. Just so you know. If you give a kid permission to play in water, they’re going to do it. So, about 6 pairs of hands dived and splashed around. And the thing that happened in that water reminded me a bit – well a lot actually – about our gospel reading and the sign Jesus performs that we read about today. It got me thinking about baptism and the life of faith. For water never stays truly clean in a setting like that. Water that sits there for human use – in almost any way – is going to get murky because it is being interacted with. It’s why we take so much care with making sure that the water we drink and play in is clean. Dirty water is never fun. So, that image of the dirty baptismal water got me thinking when I read this story again about Jesus’ sign of water turning into wine at the wedding in Cana. 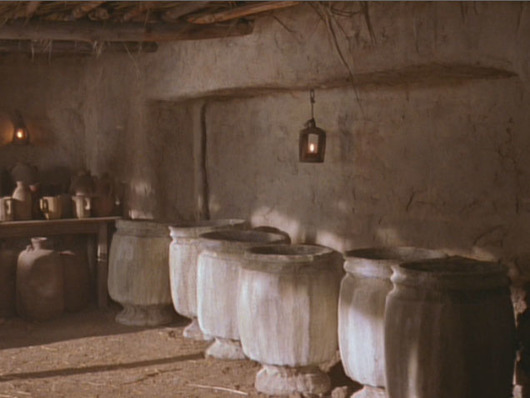 Now, when I’ve thought about those stone jars before – the ones used for ritual cleaning. I think I’ve always thought of them like a big ol’ Gatorade jug at a football game or a big tea urn at a restaurant. You know, a large holder of liquid, but with a little spicket at the bottom. Something that you can start and stop the flow of water, and the water that is used ‘first’ is the water that is closest to the opening. Make sense, right? That’s how we’d do it today. But, then, I had to remember. This story didn’t occur today. So, there’s a very good chance that there was no ‘spout’ at the bottom of the massive stone jugs that the servants filled with water. More than likely there was just a big opening at the top. Easy to pour in water, really easy to wash your hands and arms. And that got me thinking again. When using water that way to wash your hands and arms; that water is not going to stay clean. It’s going to get murky, filled with dirt, oil, and who knows what else. It’s not going to look pretty at all. Now, ladle some water out of those jars and give it to the head steward… Uhh…wait…ok? Imagine Jesus today doing something similar. He tells some workers to fill up the big water tanks on trucks that say, “NOT POTABLE WATER.” Which in English is a pretty universal sign of – DO NOT DRINK. Fill that container up, now get some water out of it and give it to the wedding director. Wait? What? Are you sure? Really? Is that really what you/he wants us to do? I thought about that potential reaction and the baptismal font of kids happily splashing in the water and realized that Jesus requires two huge things in most if not all of his miraculous signs. Trust and other people are involved. Think about it. The signs that Jesus uses to point to his and God’s glory require a lot of trust. We’ve run out of wine. Alright, ladle some of that murky water and give it to the head steward. We don’t have any food. Alright, let’s use this boy’s personal lunch that he’s willing to share to feed these more than 5000 people. I can’t see. Alright, let me spit into the ground and make mud and rub it on your eyes. My brother has died and has been dead for four days. Alright, roll that stone away. In each of those future signs to who and what Jesus is – there was a pause – whether stated clearly or implied – about whether or not one should go along with the preposterous request. Yet, each person trusted in who Jesus was and what he was saying and went through with what he asked. All were witness to God’s glory shone in and through him and those signs. Today, we live in a pretty skeptical society. We question what people tell us, we question what news reports we receive, we question the stories that we hear. A lot of time – it is good to bring a healthy dose of skepticism with us. It can protect us, keep us from being misled, prevent us from being taken advantage of. You should definitely be skeptical of that supposed royal descendent who wants to give you their fortune if only you’d give them a ‘measly’ sum of thousands of dollars. But, that skepticism can also keep us from living into the life that Jesus calls us into and the Holy Spirit guides and leads us through. Living into the life that Jesus calls us into requires a lot of faith and trust. Believing in the goodness of others, trusting in God’s goodness through others, trusting that God is at work even in the midst of struggle, having faith that what God says about you is true – that you are loved and full of worth, living life in a way that seems counter to what the world loudly shouts about, not holding on to stereotypes that keeps people at an arm’s length away. When we are able to live into the trust – even amidst our own skepticism – we at times can be witness to God’s immense glory and love. Where new relationships develop, where our devotion and love are strengthened in others, where we can see God’s work at hand in others and even through ourselves. Some might squirm at the idea of kids ‘splashing’ in the baptismal font, but perhaps that is God’s way of working into those kid’s life to bring about joy, love, and understanding of the sacraments and God’s love for them. Helping them to trust in God’s promise poured into and onto them in their baptism, so that they can continue to live into the life that God has created them for and share that love with all those around them. All knowing that this life of faith can have fun and joy in it. All because they were able to splash in the waters of baptism. That other part of Jesus’ sign is pretty important too. Jesus brings others into his ministry and life. As others trust him, he gives them action to live into. Get this water and give it. Roll away that stone. Go and wash the mud I just placed in your eyes. Pass this food out to those around you. Jesus continually lives into and cultivates a new community. A community of trust and action. Calling each of us today to do the same. Trusting in God’s work in and through our hands for the life of the world. Our Lord invites us to be a part of a community of action, drawing others together so that we can all live out that trust and faith in the world. At the end of each of those signs and miraculous deeds – Jesus’ light and life is shown to the world and those present. Each of those signs result in an over-abundance of God’s love. An immense and overflowing amount of the best wine the head steward ever had. New life out of death in Lazarus walking out of the tomb. Full stomachs from mere scraps for thousands of people. Having sight restored to those who were blind. What would it look like to trust into what God is calling us into today? Where might God be leading you that you’ve approached with skepticism? Where can we invite others and be a part of a more full and rich community of faith here at Redeemer in the life of Newberry? Where might God be leading us through all this for future ministry and service in the world? You know what – the prospect of future ministry and God’s glory typically looks ridiculous when you first begin. It might look like dirty water in a bowl, but we have trust and faith that even in that water – perhaps especially in that water – God is at work and able to do marvelous things. We join with others as we form a more full, rich, and diverse community together; living into God’s trust, faith, and call to bring love, mercy, forgiveness, and joy to a world in desperate need to hear it. That’s what Jesus’ signs point to. We still get to live into that mystery and abundance today. Amen!